To initiate a Vermont divorce, you may file a complaint for divorce without an attorney. This article discusses the Vermont Complaint For Divorce Without Children to be filed in such instances. This Form 836 can be found on the official state website of the Vermont Judiciary. Vermont Complaint For Divorce Without Children 836 Step 1: At the top left-hand corner, enter the unit of the court processing your case. Vermont Complaint For Divorce Without Children 836 Step 2: In the box on the left, enter your name, date of birth, address, telephone numbers and email address. If you have an attorney, provide their name and phone number. Enter the same information concerning your spouse on the right. 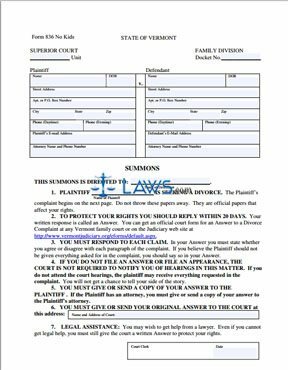 Vermont Complaint For Divorce Without Children 836 Step 3: Enter the name of your spouse above the line marked "Defendant" and your name above "Plaintiff." The court clerk will sign the bottom of this first page, which is the summons your spouse must be served with. Vermont Complaint For Divorce Without Children 836 Step 4: The actual complaint for divorce begins on the next page. In response to question one, give the county and state where you and your spouse reside. Give the residency information requested. Vermont Complaint For Divorce Without Children 836 Step 5: In response to question two, write the city and state where you married, and the date of the ceremony. Vermont Complaint For Divorce Without Children 836 Step 6: In response to question three, give the full date of your separation. Vermont Complaint For Divorce Without Children 836 Step 7: In response to question five, note whether you or your spouse are receiving any public benefits. Vermont Complaint For Divorce Without Children 836 Step 8: In response to question six, you must list any previous actions for divorce, legal separation or annulment related to this marriage. Vermont Complaint For Divorce Without Children 836 Step 9: In response to question seven, list any abuse or or protective order proceedings. Vermont Complaint For Divorce Without Children 836 Step 10: In response to question eight, indicate the military status of you or your spouse. Vermont Complaint For Divorce Without Children 836 Step 11: Under "Request For Relief," note your wishes concerning court rulings. Sign and date the form in the presence of a notary public.